…We are talking about your car’s wheel size, of course …!! What were you thinking?? 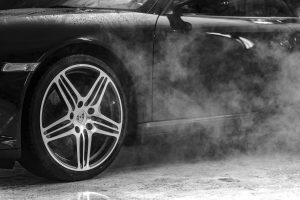 If you’re in the market for a new car or you want to boost your current one with a more aggressive look, you may have played with the ideas of going for a bigger wheel size. But what effect can larger wheels have on the overall performance of your car? Tyre sizing can be a confusing array of numbers and letters, with jargon phrases like “low profile”, “load index”, “speed ratings”. To start with, how can you find out what size your current tyres are? The easiest way is to call in at your local garage and ask someone to check it for you. However, if you are more of the independent type and you want to give it a go yourself, simply look on the sidewall of your tyre and you will see a series of letters and numbers. They will be broken down into a series like 205/55/R16/91V. Now that you know what tyre size your car features, it’s time to understand what impact a larger wheel size can have on your car’s performance. Here are a few aspects to take into consideration. One of the most popular reasons why large wheels appeal to many is that, aesthetically, they give a car a more stylish or aggressive look. Large wheels are often associated with sporty cars. However, your car may look a real badass but increasing the size will decrease the driving force from your wheels which will eventually culminate in an overall decrease in acceleration. This is because your car’s engine will find it more difficult to rotate larger wheels. Large wheels often decrease driver and passengers’ comfort. When you move to a larger wheel diameter (such as from 17 to 18 inches), you need new tyres to match. Those tyres need a lower profile (or sidewall height) to maintain a good clearance when they go over bumps and potholes, which makes the suspension fully compress and rebound. If the wheel diameter increases by one inch, the height of the tyre should decrease accordingly to compensate, in order to keep the overall diameter the same. This will result in a thinner tyre which will make you feel any impact with a pothole or road debris. Bigger wheels cost more money. The bigger you go, the more expensive the wheels and tyres will be. If you buy larger wheels as part of an option package on a new vehicle, or get them as standard equipment on a higher trim level, the initial cost may not be that high. But when it comes to replacing a damaged wheel or tyre the extra cost can be quite substantial. Fuel economy will inevitably suffer as well due to the engine having to work harder to rotate the wheels. An already powerful car will not be significantly conditioned by increasing the wheels size but the return in terms of style could be well worth the price. If your goal is to increase top speed, then changing the tyres will not make a major difference, if not in your wallet due to the increased maintenance and fuel costs. If you have any questions about what wheels size you should mount on your car, please pop in and our friendly staff will be happy to help. And whilst we are on the subject of tyres, don’t forget we can also help you by carrying out safety checks on your tyres to ensure they are within the legal limit, check your tyre pressures and check your wheel alignment. Please check the wide range of services we can offer here. This entry was posted in Latest News, Top Tips and tagged car performance, change wheels size, does wheel size matter, tyre, wheels size, wheels size matters. Bookmark the permalink.